It’s me again- Maiya – the Barely-Existant Blogger. I’m taking over primary blogging duties as Sophie is on vacation, I’ll have to apologize if I miss anything that usually happens. Tomorrow (according to Sophie’s schedule) is supposed to be a Q&A session, so if you have any questions, go ahead and comment them or email them to me at mindofabookdragon@gmail.com. I have a 2 foot tall stack of books currently to-be-read, several of which will probably end up reviewed soon! I’ll catch you all up on my life/better introduce myself in another post soon, which will maybe provide a bit of insight into me. I look forward to better getting to know all of you (including my fellow bloggers Beth and Emma) over the course of this week and a half-ish, after which I will hopefully become a much more consistent contributor. Hey, Book Junkies! This month we read The Symptoms of My Insanity by Mindy Raf chosen by the wonderful Emma. If you’re new to the group don’t worry! We’re a Goodreads group and each month a book is chosen by the moderators (Emma, Beth, and Sophie). We take suggestions for the next month, too! To access our group click here. We would love if you joined us next month! At the end of the month, we put out a book chat discussing the book of that month. Please comment on the Goodreads page your thoughts, we’d love to include other opinions! A laugh-out-loud, bittersweet debut full of wit, wisdom, heart, and a hilarious, unforgettable heroine. When you’re a hypochondriac, there are a million different things that could be wrong with you, but for Izzy, focusing on what could be wrong might be keeping her from dealing with what’s really wrong. But Izzy’s sense of humor can only get her so far when suddenly her best friend appears to have undergone a personality transplant, her mother’s health takes a turn for the worse, and her beautiful maybe-boyfriend is going all hot and cold. Izzy thinks she’s preparing for the worst-case scenario, but when the worst-case scenario actually hits, it’s a different story altogether—and there’s no tidy list of symptoms to help her through the insanity. What did you think of Izzy’s voice? Sophie: I found myself laughing out loud while reading this – she is so funny! Izzy’s voice is so relatable that I couldn’t help but love her. Beth: She’s so relatable! I loved her so much! Do you think this book deserves more hype? Sophie: Yes, I never even knew this was out there until Emma suggested it! I wish I had known sooner because I enjoyed this one. I like the plot and Izzy’s story. I loved all the characters really (okay NOT Blake, but Blake does have one redeeming moment in the end). Beth: Definitely – especially for its relatable-ness. It’s a simple but clever book and one I enjoyed very much. What are your thoughts on the title? Beth: Ahh! It suits this book so well. Simple but so perfect and spot on. What did you want to do to Blake in that museum scene? Sophie: Ditto again – I wanted her to kick him where the sun don’t shine. Did you ever find Izzy even a little bit strange? Beth: Yes! I just didn’t get that ‘art’ thing. But still, I loved her. Sophie: Yeah, but I love her quirkiness. For next month’s read we chose A Study in Charlotte by Britanny Cavallaro. This is a mystery that follows the descendents of Sherlock Holmes and John Watson. Being fans of Holmes and Watson ourselves, this decision was pretty easy. Click here for a full description of the book and to add it to your Goodreads. We would love for you to join us this month! We also have created an April Instagram challenge that will be running for the entire month. You can find it on any of our accounts (Emma @thebookcrunch, Beth @thebooksareverywhere, Sophie @mindofabookdragon). Thanks for sticking around this month – we can’t wait to see what’s in store for us next month! We hope you enjoy A Study in Charlotte! Happy reading, may your shelves always overflow with books, & read on! Hey there! Looks like Tuesdays will be the day where I post extra reviews. I consume books pretty fast, so I think it might become a regular thing. Anyway Maiya’s makeover of our blog is coming soon, and I’m excited to see what she has in store for us! 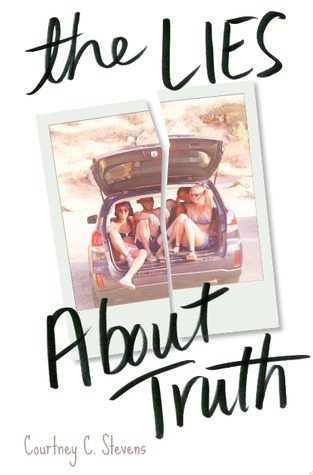 Today’s review is of The Lies About Truth by Courtney C. Stevens. Since I see a lot of reviews post some stats about the books they review, I’m going to start doing that, too. Description: Sadie Kingston, is a girl living in the aftermath. A year after surviving a car accident that killed her friend Trent and left her body and face scarred, she can’t move forward. The only person who seems to understand her is Trent’s brother, Max. Anyway you’re reading this for my thoughts on the book so here they are! It started off slow, but picked up pretty quick. I found myself feeling just so much for Sadie. I can’t fathom having to start over my life in that kind of way. I can see why she felt so inferior – she had lived and seen herself a certain way for seventeen years and suddenly everything has changed. I love that Gina, Gray, Trent, Max, and Sadie were all childhood friends. I personally have fantasized about having friends from that long ago. (Please tell me I’m not the only one!) Something about having that kind of history with someone attracts to me a lot. Grief is something that strikes people in so many different ways, and it’s very evident in this story. Sadie and Max have to deal not only with the physical changes that came with the accident, but also the emotional trauma that came with being in the car with Trent. I think there’s something so heartbreaking when we read about Max holding his dying brother’s hand. I have been struck in the feels. Give me a moment. Gina and Gray are characters not to be overlooked either. They inadvertently caused the crash and they have to live with that guilt. It something awful, and I can’t begin to imagine the pain they’re experiencing throughout the novel. I just want to take a minute to applaud Sadie’s parents. She does some kooky things and has complete meltdowns sometimes and they’re there for her the whole time. Her parents are perfect for her situation, and I would hope everyone would be as understanding as they are in a situation like that. The ending? Well, that was great. Well written to the point where it leaves lingering questions but ties up loose ends at the same time. It was sad to let these characters go, but I loved how hopeful their last lines were. I am very satisfied with how things played out. Hi, there! I know this might be old news to you, but it’s relatively new and it’s something I want to talk about because I love Emily Henry’s writing! So on Instagram Emily Henry announced two BIG things that are happening for her! The Love That Split the World has been optioned for film! Yes, you read that right – this wonderful book may be turned into a movie! Seeing the announcement made me so excited for this! Lionsgate, which has done others like Divergent and The Hunger Games, has snagged rights to producing it. We all know how book-to-film adaptions go – they’re never always as good as the book, but some do well in trying to capture the essence of the novel. Let’s not have a repeat of The Percy Jackson and the Olympians movies shall we? SHE’S WRITING A NEW BOOK!!!!!! Eeeep! I can’t believe it! As you can tell, I love TLTSTW and am looking forward to her next pieces. Here’s the description on Goodreads (so far): The daughter and son of two long-feuding families fall in love while trying to uncover the truth about a curse that has plagued their bloodlines for generations, with the help of the strange magic that haunts the homes and forests of Five Fingers, Mich.
How’s that for a segment of Bookish News? What are your thoughts? Have you read The Love that Split the World? Any other book-to-film adaptions you love (or hate)? Hey! 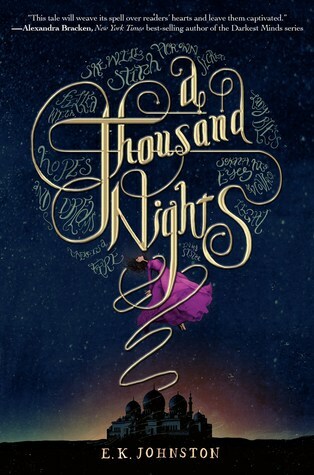 Since my epic failure of trying to read more than one book at a time, I’ve finished one of them – A Thousand Nights by E. K. Johnston. My friend read this for our high school’s book club and said it was really good, so I decided to give it a go this month. Back at the palace, the words she speaks to Lo-Melkhiin every night are given a strange life of their own. Little things, at first: a dress from , home, a vision of her sister. With each tale she spins, her power grows. Soon she dreams of bigger, more terrible magic: power enough to save a king, if she can put an end to the rule of a monster. This wasn’t what I expected – in a good way 🙂 i have not read the original A Thousand and One Nights but I do love retellings. The interesting part of the story was that our narrator remains nameless (for the most part) the entire book. I don’t know what to call her, so she’ll just be “the narrator.” Obviously her not having a name served a purpose. I think it was to show the different culture that she lived with than ours. It was a traditional patriarchal society, and while the women were subordinate to the men, they did have a certain strength and verve I admired throughout the book. Lo-Melkhiin is a character that kind of grows on you. I’m still not sure how I feel about him. On one hand, the Lo-Melkhiin is someone what isn’t himself the whole book. The way he acts toward the narrator and his general behavior is something that you start to understand the more you delve into the book. The feminist in me just can’t seem to get over the society that the characters live in. However, it is neat to see what a society like that would be like – comparatively of course. There’s an element of magic within the book that I liked. The narrator finds a certain power within her. While it is a real kind of magic, it is a kind of strength and resilience that I love. I love how her character develops. Her sister is wonderful, too. Instead of mourning the narrator, the sister works to help her from her home. The fantastical quality is that both sisters bring to the book is excellent. My Goodreads rating was 4/5 stars. Definitely would recommend this! Okay, next week will be a bit hectic for me – we’re going on a field trip Monday, a college visit Thursday, and we’re flying to Florida Friday! Other than that everything is pretty chill. Please hang in there with me! This past week has been chill actually. We didn’t have school Thursday or Friday due to conferences and I actually didn’t have any homework to do or catch up on. Prom update: I am not going to ask the second guy I was talking about. *sighs* He’s still into his ex-girlfriend so either way it’s best to wait for him to get over her. I do have my friends working to set me up with one guy we know from our band. *cough* Maiya *cough* He’s a nice guy, so I wouldn’t mind going with him. we chatted about everything from blogging to our favorite t.v. show Bones. I could not have had a better time. My awesome friend Sarah came with me, and had a great time, too! Cori was lovely enough to agree to do a Q and A on our blog here, so keep your eyes peeled for that! I also have the pleasure of helping her announce any other bookish news she may have in the future. If you have yet to read You Were Here I highly recommend going and getting a copy and supporting this awesome person. When I walked into the Barnes and Noble, there she was, just sitting all nice and waiting. I think I squealed a little. Cori and I had been communicating prior to meeting, and I was so excited to finally see her in person! She saved me the last Mik mug and gave it to me as a surprise – I couldn’t believe it. Cori also gave me a copy of her out of print book The Color of Rain which I’m hoping to get into this coming month. What else have I done in the past week you ask? Oh you know the usual. Freak out over a calculus test, band recruitment, hang out with my friends. Of course buy books. How could I not buy more books. It’s a small problem, okay? I don’t need help I can kick the addiction if I really wanted to! Since my epic failure of trying to read two books at once, I have finished both of them and another. Reviews of all three coming soon! I am now reading The Shadow Queen by C. J. Redwine, and so far it’s really good. (Click the link if you’d like a full synopsis and to add it to your Goodreads.) It picks up right amidst the action, and I can tell I will love it. As the end of the month approaches, keep an eye out for a book chat from The Book Junkies. This month we read The Symptoms of My Insanity by Mindy Raf. I will also be posting a wrap-up and some of my anticipated reads for April. I’m ahead on my reading challenge and I hope to keep it that way! How are you all? How was your week? Hello, there oh glorious Friday. Yes, it’s Friday (finally) so let us celebrate with a book tag. Next week I’m hoping to have an author interview prepared for you, so stay tuned! I wasn’t nominated for this tag directly, but Beth from The Books Are Everywhere left this up to anyone to do and I was looking for a tag so I’m going to do it. Annabeth and Percy forever. They were my first OTP and I’ve been to Tartarus and back with them. Percy would. He’d be quirky and classic all in one. It would end with an underwater kiss of course. 4. Unpopular opinions time! Name a popular pairing you can’t stand. 5. Favourite and least favourite romantic trope? 6. Do you ship non-canon couples often? Name some if you do. Oh yeah I do. Umm, off the top of my head all I can think of is Simon and Penelope from Carry On. 7. Your opinion on love triangles. Go! If they’re done well, then yes. Please just save the drama if it isn’t necessary. 8. Favourite & least favourite love triangle. 9. Sometimes romance just isn’t the way to go. Favourite friendship? 10. Favourite scene with your bookish OTP? 11. Imagine your favourite book couple again.Who’s most excited about Valentines Day (either ironically or genuinely)? Hey, there! Happy Hump Day 🙂 So since this is the first un-prompted book chat I’ve done, I decided I’d discuss the merits of the eReader. Yes, I know this is a widely debated topic. Due to its widespread nature, I want to put my two cents in, too. I decided that for my Wednesday chat days (I alternate with Beth), I’m going to debate a certain topic. I’m rambling now, so on with the debate! While I do love my Nook, I just end up buying a physical copy of the book if I love it (All the Bright Places is one very good example). The weight of the book doesn’t bother me all too much. It’s nice to see how many pages I have left while I read, too. It’s not that I want to rush, it’s just a novelty to see how much progress I’ve made. What are your thoughts? Do you own an eReader? I recently signed up to help us with book reveals and other announcements with Xpresso Book Tours. Since they come at some wonky times, some of these will come on non-designated days (by which I mean not Mondays). Today is my first one, and I’ll be revealing the cover for Under My Skin by Laura Diamond. (Please note it was originally titled Hello, I Love You. )This is a new book from Swoon Reads Romance. The pressure is getting to him. Adam stops talking to his friends back home, refuses to meet kids at his new school, and shuts his parents out entirely. His days are spent wondering if can cope with having a dead man’s heart beating inside his chest, or if he should surrender to the thoughts of suicide swirling around in his head. Outspoken artist Darby Fox rarely lets anything stand in her way of achieving her goals . Whether it’s painting, ignoring her homework (dyslexia makes a mess out of words anyway), kissing a hot boy she doesn’t even know, or taking the head cheerleader down a peg , no one has ever accused Darby of being a shy. She also happens to be the twin sister to a perfect brother with good looks, good grades, manners, and the approval of their parents – something Darby has never had. Now doesn’t that sound like an interesting book?! I’m super excited and curious to see what this book entails. I have heard of similar books, but this one definitely sounds unique. It kind of reminds me a bit of All the Bright Places in that the boy and the girl meet in unusual circumstances. I will definitely be keeping this on my radar. Now, are you ready for this awesome cover?!? Feast your eyes my friends. Isn’t it great? I really like it. It seems pretty fitting to the description of the book. Go add it to your Goodreads! There is also giveaway being held for a copy of this book. Click this link to enter. I hope you enjoy this and get excited! Another review here! This is finally the last one I have before being all caught up (until I finish the two I’m reading now of course). This book was sent to me through Uppercase Box in the February package. It was signed by the author, and came with a few other goodies. Check out the entire box review through the second link above 🙂 Melissa Landers also wrote the Alienated series, but this is the first of hers that I’ve read. I am very pleased with her writing, and I’ll have to check out her other series when I get the chance! Have you seen the movie Overboard? If you haven’t you definitely should – it’s quality, and it’s some of the inspiration for this book. I learned that through the little extras included with Uppercase. 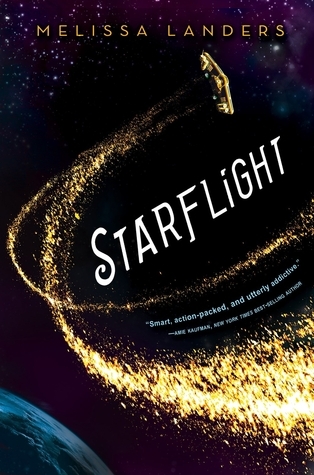 I’ve read a lot more sci-fi than I thought I liked this year. It’s good, and I did not give it enough of a chance last year. This genre is so exciting and interesting. Anything can happen in it. Solara and Doran’s world is one that is vaguely familiar, but twisted around and constructed in such a different way that makes it really interesting. I love that life originates on Earth, but it’s a luxury to live there. I think living somewhere else than Earth would be really interesting. Solara is awesome. I like her creativeness and her ability to think on her feet. I would like to think I’d be as tough as her if I was in her situation, but I’m not sure. I like the sure and true things. I’m also one for rules. Her badassery is rival to that of Adele’s from Wolf by Wolf. Doran’s turn of character was nice. It wasn’t immediate, and he did have moments of weakness. It was something that was needed and added to the story. The relationship between Solara and Doran is one I totally ship. It wasn’t rushed – it took months to develop. Sometimes I feel like the relationships in these YA books are so fast! You meet the boy/girl at the beginning of the book and it seems like two days later they’re already in love! The time lapse never seems quite believable. THE PLOT TWIST THOUGH!!! I did not see that coming. It was out of left field! It was good though. One I wish was developed and included more in the plot! Okee dokee, I’ll let ya go now! Happy reading!